The major function of the kidneys is to process the plasma portion of the blood by removing substances from it or adding substances to it. End products of heamoglobin breakdown which give urine it's 'yellow' tinge. Foreign substances such as pesticides and drugs which need to be excreted from the blood. The kidneys play a major role in body fluid composition. They have a direct effect on the blood plasma and so indirectly influence the composition of the intracellular and extracellular fluids. Osmo-regulation is another key role allowing the organ to control the concentration of water in the plasma. The Kidney's secrete protons (H+ ions) which can be picked up by anions in blood namely carbonate ions having an effect on the PH of blood plasma. The kidneys control Na+ concentration and so have an effect of volume regulation of bodily fluids. The kidneys also have a major endocrine role with many hormones acting upon it to have important effects on the plasma. Parathyroid hormone acts on the kidney to activate Vitamin D, acts to promote phosphate excretion and calcium reabsorption. Fibroblast growth factor 23 (FGF23) secreted by osteocytes acts on the kidney to inhibit Vitamin D activation and promotes phosphate excretion. Natriuretic peptides are secreted by cardiac cells acting on the collecting ducts to promote the excretion of Na+. Vitamin D is secreted by the kidneys but is activated by Parathyroid hormone. Then Vitamin D acts to promote Calcium and Phosphate absorption in the gut which as a result affects bone and teeth mineralisation.Thus, a lack of Vitamin D can lead to periodontal disease. Aldosterone is secreted by the adrenal cortex acting on the collecting ducts to promote the reabsorption of Na+. 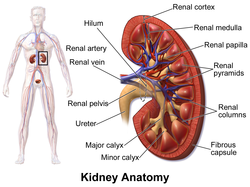 The Kidney also secretes Renin. Renin affects sodium reabsorption which affects blood volume. Blood volume consequently affects, blood pressure. ADH (Vasopressin) is secreted by the pituitary gland and acts on the collecting ducts in the kidney to encourage water reabsorption. Erthyopoietin is secreted in the response to hypoxia (low oxygen levels in a tissue) which causes the blood marrow to increase erythocyte production. Prostaglandins affect renal vessel tone. There are two kidneys which are in the posterior abdomen, inferior of the diaphragm. The kidneys are situated either side of the vertebral column between T12 - L3. They are outside of the peritoneum, with the right kidney slightly lower than the left to accommodate for the liver. They have a convex surface facing the abdominal walls and a concave surface; facing one another. Arising from the concave region is the ureter. The ureter goes to the bladder and then urine can be expelled through the urethra. The organ has two distinct tissue regions. The outer region is the cortex, the inner region is the medulla. The corpuscle consists of the glomerulus and the Bowman's capsule. The internal part of the capsule is a region filled with fluid called the Bowman's space. The glomerulus is supplied by two arterioles in series; the afferent (blood enters the glomerulus) and the efferent (blood leaves the glomerulus). A tubule; this extends from the renal corpuscle. It is a long, thin and hollow tube. Cortical nephrons are the most abundant at 85%. These nephrons have a short loop of Henly with their renal corpuscle in the outer two-thirds of the cortex. Juxtamedullary nephrons are less abundant at 15%. These have a long loop of Henly with their corpuscle in the inner one-third of the cortex. These are thought to be important in producing concentrated urine. The renal corpuscles are only found in the Cortex region of the kidney. Each nephron is individual and only merges with others at the level of the collecting ducts. All urine drains into the central collecting duct of the kidney called the Renal pelvis. The Tubule is divided into many different parts depended on it's surrounding vessels and direction. A major part is the loop of Henly. The Peritubular capillaries are called such as they surround the tubule. The vasa recta is the region of the peritubular capillaries which surround the loop of Henly. Damage to the glomerulus via high blood pressure or infection can lead to protein in urine, haemoglobin in urine or even red blood cells in urine. The endothelium of the capillary has large pores about 100nm in size. This makes the vascular bed highly permeable. The epithelial lining of the Bowman's space is highly specialised and is a tubular epithelium consisting of Podocytes and filtration slits. Molecular size is important. Molecules larger than 7000 daltons begin to be restricted and this clearly with proteins. Albumin, the bulkiest protein in blood is almost negligible in concentration in the filtrate. Charge is important because the basement membrane of the interface is negatively charged. This repels other anions and attracts cations. This makes the filtration of anions 'less likely' but will 'encourage' the filtration of cations. Juxtaglomerular apparatus consists of the Juxtaglomerular cells on the arterioles and the macula densa found in the distal tubule. The Mesangial cells of the distal tubule are not part of the apparatus but are significant because they contain myofilaments which allow them to contract. This contraction affects the surface area for filtration. Tubular Reabsorption is the movement of fluid from the Bowman's space into the peritubular capillaries. Tubular Secretion is the movement of fluid from the peritubular capillaries into the Bowman's space. Occurs mostly in the proximal tubule and collecting ducts. Glomerular Filtration only occurs in the corpuscle. This is the movement of fluid from the glomerulus to the Bowman's space. This process is fairly non-selective, not requiring special proteins for certain solutes. Excretion; when a substance is passed into the urine and removed from the blood to be eliminated. These processes will not occur to every molecule, so it will vary considerably. The amount of a substance excreted in urine is equal to the amount filtrated plus the amount secreted minus the amount reabsorped. Some substances are metabolised in the tubule by the epithelial lining and are broken down e.g. Glutamine. Water is filtered and for most part is reabsorbed back into the blood with a little being excreted. Glucose is filtered and completely reabsorbed back into the blood and therefore is not excreted and therefore should not be found in the urine. Para-aminohippuric acid is a molecule which is filtered and secreted entirely. This is noted as, none of the substance is found in the capillaries after the nephron and so all of the substance is excreted. It is used as a diagnostic. Overall, the composition of the plasma is close to the composition of the ultrafiltrate with some key differences. These differences are mostly proteins and glucose. It is important to note that solutes which bind to albumin will also not be present in the filtrate e.g. acidic drugs and Calcium ions. Surface area is important. The mesengial cells are sympathetically innervated. So an increase in sympathetic activity will cause the arterioles to contract decreasing the surface area for filtration therefore reducing filtration. Hydrostatic pressure can affect GFR. If the afferent arteriole is constricted, there is a reduced driving force/blood pressure of the plasma which reduces the hydrostatic force. This means there will be reduced filtration. Dilatation would do the opposite. If the efferent arteriole is constricted, this increased the hydrostatic pressure of the capillary - increasing blood pressure. This means that there will be increased filtration. Dilatation would do the opposite. GFR is regulated by both hormonal and neural controls. The plasma is cycled round at least 60 times a day which allows the kidney to closely monitor and alter it's composition. Renal clearance is the volume of plasma that is cleared of a substance in a given time. It is the conc. in the Urine multiplied by the vol. of Urine/min divided by the conc. in the plasma. Urine produced in the kidneys is conducted by the ureters and stored in the bladder until excreted via the urethra. The major blood supply to the kidneys are the renal arteries. These vessels stem off from the abdominal aorta. With each kidney having renal vein(s) which drains blood into the inf. vena cava. The renal hilum is the site of entry for the renal blood vessels and the ureters. The afferent arteriole is wider in diameter than the efferent arteriole in entry via the vascular pole of Bowman's capsule. Therefore the pressure gradient must be maintained and so, we get filtration of plasma into Bowman's space. Kidneys have papillae, 'tips' of medullary lobes often called renal pyramids. Urine is emptied here into a calyx which is an extension of the renal pelvis. The renal pelvis is essentially a 'funnel', allowing urine to pass into the ureter. The pelvis is where many major calyces come together to drain. The ureter is a muscular tube that takes urine to the bladder. Urine moves via peristalsis thanks to two layers of muscle; longitudinal and circular. There is a urothelium present with lamina propria, rich in collagen. The outer convex region is the renal cortex. These are the fused cortical parts of the medullary lobes. The entire kidney is surrounded by a thick fibrous capsule with a layer of fat for insulation and impact protection. Renal corpuscles are only found in the cortex of the kidney and under a microscope, the majority of the slide is covered with the tubule element of the nephron. Usually the proximal convoluted tubule (PCT) is more prevalent than the distal convoluted tubule (DCT). The PCT is the longest part of tubule and where a majority of reabsorption occurs. It has a simple columnar epithelium with microvilli and many mitochondria for active processes. Some capillaries from the efferent arteriole collect molecules from the PCT. The DCT is found within the cortex and is responsible many for the resorption of Na+ via aldosterone. The epithelium is simple cuboidal. Collecting tubules are extensions of the DCT. Many collecting tubules converge to make a collecting duct. Ducts then go towards to the renal medulla forming larger ducts of Bellini that drain urine from the papilla into the renal pelvis. Important in producing concentrated urine by the passive reabsorption of water in the medullary interstitium due to the osmotic gradient created by the counter-current system of the loop of Henle. This is controlled by vasopressin (ADH). A specialised region of the nephron known as the juxtaglomerular apparatus is a specialisation of the afferent arteriole and the DCT of the same nephron. Important in regulating blood pressure via renin-angiotensin-aldosterone system. The macula densa of the DCT are a group of closely packed epithelial lining cells facing the afferent arteriole. The juxtaglomerular cells of the afferent arteriole are smooth muscle able to contract and secrete renin. Lacis cells are derived from mesagials and may be important in erythopoetin secretion. The basement membrane of the glomerular capillary is particularly thick as it is formed by two lamina; lamina of the endothelium and the lamina of podocytes. The podocytes have primary and secondary processes called pedicels which attach to the glomerular BM. Gaps between pedicels form filtration slits. The capillary has a fenestrated endothelium. This allows the filtration of some solutes through fenestrae. Osmolality is important in renal function. Osmolality is the number of milliosmoles per kilogram and the higher the osmolality of a solution, the lower the water concentration of the said solution. Plasma osmolality has a small range but remains at approximately 300 mosm/l. The main osmotically active solute is Na+. With the concentration being 140 mmol. Sodium is freely filtered by Bowman's capsule as it does not bind to proteins. Its rate of filtration can be calculated by Glomerular Filtration Rate multiplied by Plasma Concentration of Na+. Large amounts of sodium are filtered but the majority is reabsorbed at the tubule. Sodium is never secreted. Urine osmolality has a wide range of 50-1400 mosm/l depending on whether the urine is dilute (low osmolality) or concentrated (high osmolality). Tonicity and Osmolarity are similar but different. Tonicity refers to non-penetrating solutes but osmolarity refers to both penetrating and non-penetrating solutes. So with regards to the tubule, the filtrate is isotonic with plasma on entering - as the turn of the loop of Henle the filtrate is hypertonic and then the top of the ascending limb, the filtrate is hypotonic. Sodium reabsorption is for the most part, an active process requiring ATP hydrolysis. So where there are large quantities of mitochondria in the tubule, it is more than likely sodium reabsorption occurs there. Area of high mitochondria density are the PCT, DCT, Thick AL of the loop of Henle and the principal cells of the Collecting duct. Sodium reabsorption happens using transporters. Drugs target these transporters and will as a result, affect blood pressure. The majority (65%) of filtered Na+ is reabsorbed in the PCT. 25% in the TAL of the loop of Henle, 2-5% in the DCT and 5% in the collecting ducts. In contrast, little Na+ reabsorption occurs in the descending and thin ascending limbs of the loop of Henle. The thin ascending limb does have some passive Na+ reabsorption. Water reabsorption in the PCT is dependent on osmosis, sodium reabsorption and tubule permeability. The filtrate volume will be reduced in the lumen but not the osmolality. In order to get a concentrated urine, sodium and water reabsorption must be separated and high osmolarity of the medullary interstitium must be established into to drive water reabsorption. This is done in the loop of Henle. Separation of Na+ and water reabsorption occurs in the loop of Henle. The limbs are in parallel and have a counter-current flow. The loop reabsorbs more salt than water so the separation occurs here. The thick ascending limb has the sodium-potassium-chloride cotransporter allowing the absorption of salts However, the limb is impermeable to water so, water will remain in the tubule. Separation in the Thick AL The thin avenging limb absorbs sodium and water passively. The medullary interstitial fluid requires a high osmolality to drive water reabsorption and this is done by osmosis and the countercurrent multiplier. Urea is also responsible for maintaining a high osmolarity in the medullary interstitium. It is a small molecule, freely filtered and is non-toxic. Secretion returns some of the urea back into the lumen of the tubule. This is done by UT-A2 (urea transporters) on the lumenal membrane. Approximate 60% is secreted. Reabsorption then occurs again in the inner medullary collecting duct. via UT-A1 and UT-A3 transporters. Water reabsorption is driven by the high concentration of urea in the interstitium. Approximately 70% of urea is reabsorbed. Urea goes under passive reabsorption with upto 50% being absorbed in the PCT into the interstitium. This either happens across the membrane or between epithelial cells via diffusion. The blood supply to the loop of Henle ensures that the gradient of osmolarity is not washed away. It is of similar shape to the loop with descending and ascending limbs but both limbs have the same permeability. The blood supply to the loop of Henle is a section of peritubular capillaries called the vasa recta. ADH is secreted by the posterior pituitary gland. It acts on V2 receptors of the membrane which activates a GPCR. Which via adenylyl cyclase, a cyclic-AMP mediated event occurs. Using protein kinase A, a signal cascade is produced to express AQP-2 channels allowing water reabsorption in the duct. AQP-3 and AQP-4 allow water to leave the epithelial cells and enter the interstitium. Due to the high osmolarity in the ascending limb of the vasa recta, water is then reabsorbed into the blood and taken away to other parts of the body. Overall, concentrated urine is dependent on having a high osmolarity in the interstitium to drive water reabsorption and also, the level of water permeability in the collecting duct but also that the duct passes through the concentrated region of the medullary insterstitium. Phosphate reabsorption is dependent on Na+ via a sodium-phosphate co-transporter in the PCT. Parathyroid hormone is secreted by the Parathyroid gland and encourages Vitamin D metabolism. Ca2+ and Mg2+ are reabsorbed passively in the PCT. The majority of Ca2+ reabsorption occurs in the distal tubule. TRPV5 Ca2+ channels and Ca 2+ transporters are there to absorb. The calcium transport protein in the epithelial cells is called calbindin and is reliant on vitamin D and PTH activation. Potassium reabsorption and secretion are important as they help maintain cell excitability and the resting membrane potential. If K+ is too high, likely to get cardiac arrhythmia etc. Majority of potassium is passively absorbed in the proximal tubule. Potassium ions are also absorbed in the thick ascending limb. Na+-K+-2Cl- contransporters are present to allow reabsorption into the interstitium. Potassium is also reabsorbed in the collecting ducts by both the principal and intercalated cells. Potassium is reabsorbed and exchanged for protons in the intercalated cells (responsible for acid-base balance). This is all outweighed by K+ secretion of the principal cells. Alkalosis inhibits it and acidosis; promotes it. High tubular flow rates enhance secretion. Diuretic drugs are drugs which increase the excretion of salts and water thus encouraging urine production. Diuretics work by reducing Na+ and Cl- reabsorption in the nephron this reduces water reabsorption = more urine. Oedematous conditions as a result of, heart failures, kidney and hepatic diseases are usually treated by diuretics. Oedema is the abnormal accumulation of fluid in the interstitia. These fluid imbalances are caused by changes in either hydrostatic or oncotic pressure. Oncotic pressure can either fall or the hydrostatic pressure will increase according to starling's equation. This leads to excess filtration of fluid into the interstitium. The prophylaxis for these are loop diuretics and K+ sparing diuretics. Thiazide-type diuretics are used to treat Hypertension. They are able to reduce blood volume thus cardiac output and so, reduce blood pressure. Loop diuretics inhibit the Na+-K+-2Cl- cotransporter (NKCC2) on the apical membrane. This prevents the reabsorption of sodium in the thick ascending limb. These drugs can cause adverse effects such as hypokalemia, hypovalemia and deafness. These drugs should not be taken before dental surgery to reduce the patient's need to urinate. Loop diuretics cause a powerful diuresis as they prevent the establishment of a high osmolarity in the medullary interstitium. This means some salts remain in the tubule, isosmotically taking water alongside e.g. furosemide. There are also tight junctions between the tubular cells in the loop of Henle. The high concentration of K+ in the tubule via ROMK (renal outer medullary K+) channels creates a potential difference across the membrane driving positive cations through these cellular junctions into the interstitium due to repulsion. Thiazide-type diuretics inhibit the Na+-Cl- cotransporter on the apical membrane. This prevents sodium reabsorption in the DCT; an example is bendroflumethiazide. These drugs are of medium efficacy and cause a reduction in plasma volume and consequently affect Cardiac output. They also reduce TPR by an unknown mechanism of vasodilatation and are used to treat hypertension. Adverse effects include hypokalemia, hyperuricaemia (build up of Urea in the blood which can make gout worse) and hyperglycaemia. NSAIDs can affect Thiazide treatment. K+ sparing diuretics inhibit the activation of ENaC channels by acting as a competitive antagonist. This can cause hyperkalemia; too much potassium in the blood which in turn leads to arrhythmias. These are of the lowest efficacy. Usually, Na+ is reabsorbed in the collecting tubule via ENaC. Whilst K+ is secreted via ROMK channels - these processes occur in the principal cells. But, in the Type A intercalated cells, we have a K+/H+ exchanger pumping protons into the tubule. Aldosterone upregulates the entire process by promoting the protein synthesis of ENaC and Na+/K+ pumps. Amiloride blocks ENaC, preventing K+ secretion. Spirolnolactone antagonises Aldosterone as it breaks down into Canrenone (active ing. ), reducing the expression of these Na+ assisting channels but is very slow onsetting. Spironolactone is most useful during events of high aldosterone e.g. post cardiac failure or hyperaldosteronism. After heart failure, there are high levels of Aldosterone which can reduce the effectiveness of cardiac cells. Therefore, using spironolactone can help with post-cardiac prophylaxis. K+ secretion could cause hypokalemia of the blood. Hypokalemia can cause cardiac arrhythmias - this is why these diuretics are used alongside K+ sparing diuretics or potassium supplements. H+ secretion could metabolic alkalosis of the blood. In the thick ascending limb, some Na+ reabsorption occurs but as the limb is impermeable to water, no water is reabsorbed. Some Na+ is reabsorbed in the DCT. The majority of reabsorption occurs in the PCT, 60% of salt and water are absorbed at this stage. There are currently no diuretics which work in the PCT. Aldosterone is secreted by the adrenal cortex. It is a steroid hormone and affects the transcription of particular transporters/cotransporters e.g. ENaC and Na+/K+ ATPase pump favouring Na+ reabsorption. Vasopressin causes water reabsorption in the collecting duct. This dictates whether we get a hypertonic or a hypotonic urine. As the salt balance is tightly controlled, this has a significant effect of the volume of plasma. The main salt constituent is NaCl. Therefore, Na+ concentration dictates volume. Osmoregulation takes precedence over volume control so the osmolarity of ECF should always be maintained even if the volume changes especially in the brain. Sodium excretion is equal to the amount of Sodium filtered minus the amount reabsorbed. These processes are regulated by changes in GFR and reabsorption. GFR depends on starling's forces, hydraulic permeability and surface area and is regulated by neural and hormonal controls. GFR is extrinsically controlled. The afferent arteriole is sympathetically innervated, so when blood pressure falls - it is subject to the baroreceptor response. So when the AA vasoconstricts, GFR falls but also the mesangial cells constrict (contain actin) to reduce surface area for GFR so this will conserve water and sodium in the tubule. GFR is intrinsically controlled mainly by auto-regulation of the vessels via myogenic feedback or tubuloglomerular feedback to protect renal capillaries and maintain healthy GFR. When the hydrostatic pressure rises/falls, the AA responds by constricting/dilatating - this is myogenic feedback. The aim of this is to maintain capillary pressure, GFR and renal blood flow. There are multiple regulatory pathways which help control sodium reabsorption. Renal sympathetic nerves stimulate renin release. The juxtaglomerular cells of the juxtaglomerular apparatus receive signals from the baroreceptors to secrete their granules which contain renin. This is extrinsic. The tubuloglomerular feedback is an intrinsic feedback. The increased delivery of sodium to the macula densa increases the concentration of adenosine. Adenosine binds to A1 receptors to increase Ca2+ concentration in the juxtaglomerular cells which causes a vasoconstriction to inhibit renin release. Renin may be released due to a reduced delivery of Na+ to the macula densa. Delivery is equal to concentration multiplied by flow rate. It is also secreted as a result of sympathetic innervation via the baroreceptors or by low blood pressure/volume. Renin causes plasma angiotensinogen to degrade into angiotensin 1. Angiotensin-converting enzyme (ACE) converts Ang1 to Ang2. Angiotensin 2 then has a variety of effects. Angiotensin 2 stimulates Na+ reabsorption in the proximal tubule, stimulates ADH release and the release of Aldosterone. Aldosterone is secreted from the adrenal cortex (zona glomerulosa). It causes increased Na+ and water reabsorption at the PCT, CD, sweat glands and salivary glands as it acts as a steroid hormone. The intracellular fluid is roughly 28 litres and potassium is the main constituent. However, extracellular fluid is14 litres and the most abundant solute is Na+. Maintaining the ECF via plasma osmolarity affects all other fluid compartments. Acid-Base balance is important in almost all metabolic reactions because these reactions rely on enzymes. Enzymes are sensitive to proton concentration and usually have an optimum PH between 7.35-7.45 which is the PH range for the ECF (plasma + interstitial fluid). The PH of the ICF and organelles varies from the ECF and is usually lower. Acid balance must be maintained. Protons come from ingestion and metabolic processes and so must be excreted to keep a balance. The balance of the PH is kept by buffers. The body has a variety of buffering systems. For example, the blood can be buffered by bicarbonates and haemoglobin. Protons can readily enter cells thanks to the H+/K+ exchanger. Hendersson-Hasselbach used to calculate PH of buffering systems. With regards to the bicarbonate system, PCO2 can replace [H2CO3]. The bicarbonate buffer is special as it is handled by two organs. [HCO3-] is controlled by the kidneys whilst PCO2 is controlled by the lungs. The benefit of the buffer is that when acid is added, this causes the production of carbon dioxide - this will drive respiration and in doing so increases the PH caused by carbonic acid dissociation due to le Chatelier's. The buffer has a time limit as bicarbonate will eventually run out. There is approx ~ 25Mm of it in the plasma. But fortunately, it is reabsorbed at the level of the kidney whilst protons can be excreted. There are bicarbonate transporters which transport bicarbonate into the interstitium so it can be reabsorbed via the peritubular capillary. The proton on the other hand is secreted into the lumen by a transporter (H+/K+ ATPase pump, Na+/H+ cotransporter etc.). If there is no bicarbonate then, it will be excreted. If bicarbonate is present in the lumen then - it will bind to the proton to reform carbonic acid. This can then dissociate into water and carbon dioxide and passively re-enter the cells. The same process occurs inside the cell as with bicarbonate reabsorption. Once, the proton is secreted - it binds with monohydrogenphosphate to form dihydrogenphosphate which can then be excreted. Whilst, bicarbonate is still absorbed on the basolateral side. Normal plasma PH is measured at a nanomolar level (35-40nM H+), whilst acid production is in millimolar. Respiratory acids are volatile and are produced by the lungs. Non-respiratory acids are non-volatile and are produced by the kidneys. Protons can be gained or lost through certain processes. These processes are either at the sites of the lungs or kidney. Protons can be gained by a loss of bicarbonate in urine however, usually all bicarbonate is reabsorbed. Protons can actually be passed through urine and lost as well. Protons can be gained from carbon dioxide. Carbon dioxide dissolved in water forms carbonic acid which can dissociate into bicarbonate and a proton. As the reaction is reversible this gives us two possible scenarios. In the case of carbon dioxide, it is usually expelled and so it's concentration is low. Due to le Chatelier's principle, the reaction will always be to the left to produce more of it so little acid is produced. With hypoventilation, carbon dioxide is not being expelled as ventilation is not sufficient. This build up of CO2 will cause the reaction to shift to the right - causing a gain in protons and bicarbonate. Hyperventilation will cause a loss of protons as CO2 is being expelled quickly causing the reaction to shift to the left with water being formed using the protons. Protons will be gained by the production of non-volatile acids from the metabolism of protein e.g. phosphoric and sulfuric. Thus, having a high protein diet will cause a net gain of protons. Conversely, protons will be used in the metabolism of other molecules causing a loss. Disruptions in acid-base balance can lead to disorders. When a disorder like this occurs, the body must compensate to attempt to return PH to normal. Acidosis can either be respiratory or metabolic is when PH falls below 7.35. Respiratory acidosis is caused by insufficient CO2 expulsion from the lungs. An acute form is asthma whilst a chronic form is fibrosis - likely to be hypoxic. Chemical buffers will try to reduce PCO2 e.g. bicarbonate system. The respiratory centre would have no effect as this is a respiratory problem. Renal compensation will mostly be from bicarbonate production and reabsorption e.g. Glutamine metabolism leading to an acidic urine. Metabolic acidosis is usually caused by a fall in plasma bicarbonate concentration and can described as either H+ gain (increased anion gap) e.g. ketoacidosis or a bicarbonate deficit (normal anion gap) e.g. diarrhoea. Ketoacidosis is an example because ketone bodies can contribute to the production of more bicarbonate but are excreted increasing the anion gap. Chemical buffers would cause PCO2 to increase as the protons react with bicarbonate to produce CO2. This drives respiration in the brain stem respiratory centre to reduce PCO2 by expiration. Renal compensation will come from Glutamine metabolism. Alkalosis can be respiratory or metabolic and is when PH is above 7.45. Respiratory alkalosis is caused by excessive respiratory drive or hypoxia. This means excess CO2 is expelled from the lungs and PCO2 is low (hypocapnia). Chemical buffers would shift to promote CO2 production, reducing both bicarbonate and proton concentrations. The respiratory centre would try to reduce ventilation rate if possible. Whilst, the kidneys would ensure that not as many protons are secreted back into the tubule so bicarbonate can be excreted. This results in an alkaline urine. Metabolic alkalosis is caused by high plasma bicarbonate concentration and can be caused by vomiting gastric acids. As bicarbonate is high, one would expect PCO2 to increase whilst bicarbonate decreases due to the buffer however - due to the high PH; respiration is inhibited causing CO2 to be retained. However, the resulting hypoxia may drive the brain to force respiration forward. The renal mechanism is to stop proton secretion and cause bicarbonate excretion. The compensation comes in three forms. These are chemical buffers which are fast acting, the brain stem respiratory centre and renal mechanisms (take the longest to act).